Semi-automatic pouch loader is a weigh scale filler integrated with band heat sealer. Ideal for loading food products like beans, coffee, pet foods, spices, rice, nuts, etc. into standup pouches. Can also load powders. The operator places bag under filler, filler automatic loads a predetermined amount of product, operator then places filled pouch into heat sealer. 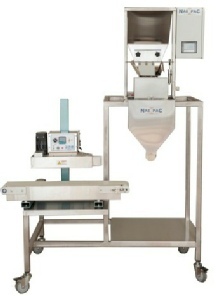 Filled bag is sealed and automatically moves along conveyor to discharge. Ideal for loading gusseted stand up pouches, coffee pouches, and zippered pouches. Scale accuracy at 0.5% of system capacity. Scale contact parts are stainless steel and removable for wash-down. 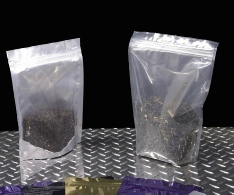 Sealer and conveyor are specifically designed for stand-up pouches. Will seal: polyethylene, polypropylene, laminates, nylon, PET/ polyester.